The event drew attendance from 80+ decision makers from leading retailers. On 12-13 March senior retail leaders gathered at the Luton Hoo, Golf, Hotel and Spa in Bedfordshire to exchange insights, successes and crash landings, create valuable conversations and forge connections. Over one and a half days The Retail Hive Team delighted and surprised their members with beautiful surroundings, quality keynote sessions and personalised roundtable discussions. When the learning and networking was done it was time for entertainment! First of all it was networking drinks which included The Hive Network’s version of Dragons Den – in which three start-ups pitched their tech solution to a panel of thought leaders. A three-course gala dinner (complete with singing waiters!) followed and the evening was rounded off with a casino, with all proceeds going to Make-A -Wish. The Hive Network contributed £1000 to get everybody warmed up and then it was over to the members who dug deep to deliver well beyond the £3000 target. The Hive Network builds communities to share experience and ideas. They draw on the principles of collective intelligence – unlocking knowledge from across a range of organisations to drive innovation throughout the industry. ‘In a challenging time for Retailers it is wonderful to see senior leaders come together to benchmark and share their successes and experiences with each other including the highs and the lows. Being open & honest; challenging & engaging; and having fun and able to enjoy each other’s company in a relaxed environment allows for a wonderful learning experience as well as promoting collaboration & community. 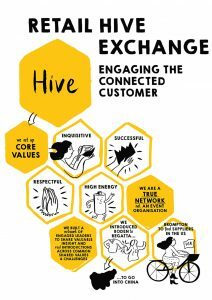 The power of a network extends beyond more than just an event and the Retail Hive members exemplify this every time they meet’ Sally Green & Noj Mather, The Hive Network.